We don't talk about comics enough here. While the list of comics I read regularly has dwindled significantly through the years, I still come across a few here and there that catch my eye. So it was when an advance copy of Dark Horse's Dragon Age: Magekiller #1 found its way into my hands. Dark Horse has done excellent work with Dragon Age in the past (especially the World of Thedas books) though it has mostly been confined to characters within the games. 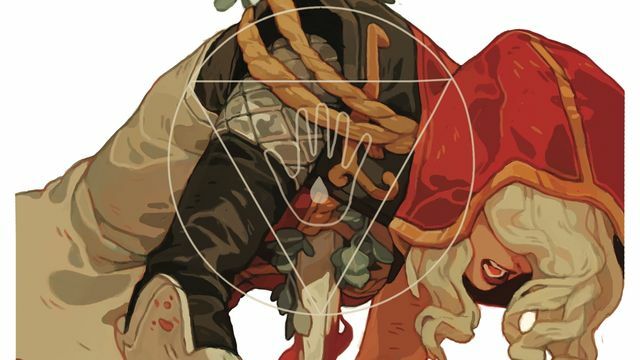 Magekiller marks their first venture with wholly original characters, but it is no less a success. I'll admit that I'm unused to reading comics issue by issue. When I buy comics these days, I'm usually late to discover it and read most of the series through collected volumes. Reading Magekiller #1 was difficult because it left me wanting so much more. I want to be upset about how short it is but it is important to remember that the first issue is meant to be a hook, and in this Magekiller is most effective. Tessa Forsythia and Marius are highly skilled mage hunters. We don't know much about their background yet, but I imagine that will be expounded in later issues. What we do know so far is as follows; Marius is in charge, although Tess does all the talking, setting up jobs and the like. We could call her a handler, but her role is a little more than that. The art in Magekiller is polished and well laid out. In many comics, especially some of those based on video games, it is common to see rooms and environments that seem sparse or empty. I'm happy to note that this is not the case in Magekiller. Carmen Carnero's pencils and Terry Pallot's inks are detailed without becoming too busy. The environments they create feel lived in, and the colors by Michael Atiyeh place the Dragon Age palatte for atmosphere perfectly. Greg Rucka's writing fits quite well into the Dragon Age universe as well. There is a particular tone that much of the game series has. It has always been serious and dramatic, but the games have never been shy about humor. Carefully used and reserved, the humor of Dragon Age is less about absurdity than about relationships and how exceptional characters handle the mundane details of life. Magekiller's tone is no different. I shouldn't give too much away, but the first issue has set up what promises to be very interesting story. I'm quite interested to see where things go from here. Any fan of the games should find themselves quite at home with Magekiller and people looking for a place to start with Dragon Age may find it a nice place to start without having to navigate too many spoilers from the games. You'll find issue #1 in shops on December 16th and available for pre-order now.